Many players attempt to hit deep by hitting the ball harder. This is not a solution to try. For some reason the notions of hitting deeper and hitting harder go together for most players. Do not fall prey to this pitfall or you will overplay your deep shots. To hit a ball deep simply requires an open racket face not excessive power. We have all had the experience of barely touching the ball with an open racket face and watching it sail yards beyond the baseline! The true solution: DO NOT hit the ball harder to achieve depth. Instead, slightly open the racket face. When your ball lands long on your serve you solve the problem by backing up a foot or two on your next serve. This is not a solution to try. 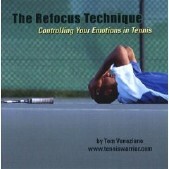 Instead you should maintain your position on your serve and adjust the racket face. Just like on groundstrokes you can hit with a closed or an open racket face. In this case you must close the racket face to stop the ball from sailing long on the serve. Of course if you close it too much you will hit the net. Trial and error and repetition are the only answer. The true solution: DO NOT change your serving position. You close or open the racket face by changing grips. This is not a solution to try. 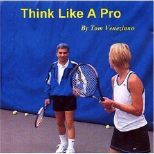 To close or open the racket face hold the racket with your normal grip for that shot and change your wrist position. Slight movements in your wrist will change the face of the racket. Just as when you lob you roll the wrist to open the face of the racket you should do the same on all of your shots. The true solution: DO NOT change grips to open or close your racket face! All three of these true solutions are simple but take time to learn. Solutions can be simple but not instantaneous. Tennis Warriors put in the time and pay their dues!